Challenges within traditional accounts payable (AP) departments are nothing new. 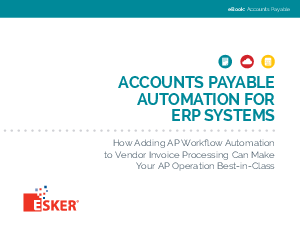 However, as companies feel the impact of high processing costs and manual inefficiencies on their bottom lines, the need for an automated workflow solution to complement ERP applications is critical. This eBook addresses common AP challenges and proposes a solution: leveraging an end-to-end automation solution to achieve a best-in-class AP operation.